If you were in an accident in an Uber in Chicago, your first questions might be about the driver, and what Uber requires of them to get behind the wheel. While Uber does background checks, they do not do them in person, so there is a certain degree of risk when getting into an Uber. In 2014, Uber received an “F” from the Better Business Bureau, a grade that it maintains thanks to more than 200 negative reviews and just seven positive ones. Most people who negatively reviewed Uber said they were either harassed by their driver or they were charged unwarranted cleaning fees. There are certain minimum requirements an Uber driver’s vehicle must meet. The vehicle must have a valid registration, although it does not need to be registered in a driver’s name, so rental cars are allowed. All Uber drivers must carry their own insurance, which generally doesn’t cover drivers who are using their vehicle for profit, but as ridesharing services grow, many insurance companies are offering ridesharing insurance to augment traditional personal insurance policies. Farmers Insurance, Allstate, State Farm, Geico, USAA and Liberty Mutual are among those companies in the Chicago area that offer additional coverage for Uber drivers. Uber also maintains liability insurance for all of its drivers. What Ubers are on the Road in Chicago? There are several different Uber options for passengers to choose from, ranging from basic to luxury packages. UberX. UberX vehicles must be a 2002 or newer four-door car in good condition. At least four passengers plus the driver must be able to be seated. No full-size vans or trucks can drive under the UberX plan. UberXL. This option is designed for larger parties. Drivers must have a vehicle that is a 2002 or newer that must be either a four-door SUV or a minivan with independently opening doors. It must seat at least six passengers, and full-size vans or trucks are not allowed. UberSELECT. This luxury category requires vehicles that are 2008 or newer with air conditioning, working windows, and leather or vinyl interior seats with no tears. At least four passengers plus the driver must be able to be seated comfortably. UberBLACK. Vehicles must be 2015 or newer, black only, with black leather or black vegan leather seats only. UberBLACK drivers are required to carry commercial insurance and carry City of Chicago livery plates. Vehicles must seat at least four passengers. UberSUV. Vehicles must be 2015 or newer and able to seat at least six passengers. Only black vehicles with black leather or black vegan leather interior will be eligible. UberBLACK drivers must have commercial insurance and carry city of Chicago livery plates. UberCAB. UberCABs must be a registered taxi with the Chicago Business Affairs and Consumer Protection and must be covered by commercial insurance. Drivers must be at last 21 years old. UberEATS. Vehicles model year 1997 or newer or bicycles are eligible for UberEATS, which delivers food from participating restaurants. Drivers can be 18 years old, so it’s a good entry into Uber. Drivers are also eligible for discounts including food and automobile services including maintenance, as well as other perks including cell phone discounts (AT&T, Sprint, and Verizon, so far), help finding affordable health insurance and access to financial service providers including H&R Block to help drivers manage their money and handle tax time. According to Uber, there are some areas of Chicago that are much busier than others and generate the most Uber traffic. Traffic depends on a variety of factors, and some areas are busier on the weekends, but O’Hare International Airport, Navy Pier, Wrigley Field and Soldier Field are always busy. The more traffic generated in an area, however, the more chance of an accident. Were You Using Uber and got into a Car Accident? In Chicago, Uber accidents are as common as taxi accidents, perhaps more so as more drivers choose the less regulated ridesharing service as their method of money making. Drivers must tangle with both brutal traffic and months of inclement weather, making travel treacherous. So, what is a person to do if they are in an accident while as a passenger with Uber? 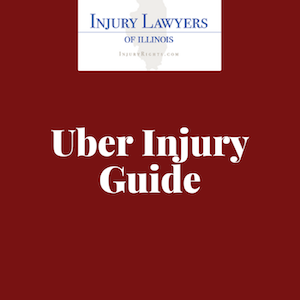 Because of the complicated legal landscape, hiring an attorney for an Uber injury could be a good first move. Uber does provide insurance for its drivers and passengers in the event of an accident – coverage starts as soon as the driver begins using the app and grows up to $1 million after the driver picks up a passenger. Hiring an attorney means that you have someone in your corner who will fight to get you the compensation you deserve to cover the costs associated with your injuries.